Three of the four Republican gubernatorial candidates attended a debate in Bowling Green hosted by Americans for Prosperity Tuesday night where they talked about their visions for the future of the state and many issues important to the business community. The debate began with discussion of health care issues and what they would do as governor to address the health care needs of the state. Agriculture Commissioner James Comer and Louisville business men Hal Heiner and Matt Bevin were asked about the health exchange established in Kentucky (kynect) as part of the Affordable Care Act. All three candidates stated that they would dismantle the health care exchange in their first year because of the fiscal impact that is set to come due in that time. This is because the large majority of Kentuckians utilizing Kynect qualify for the new Medicaid expansion. The federal government has been paying the full expense of the state’s Medicaid expansion, but in beginning in 2017 Kentucky will begin paying for a portion of the expansion, eventually up to ten percent —something the GOP candidates said the state cannot afford. 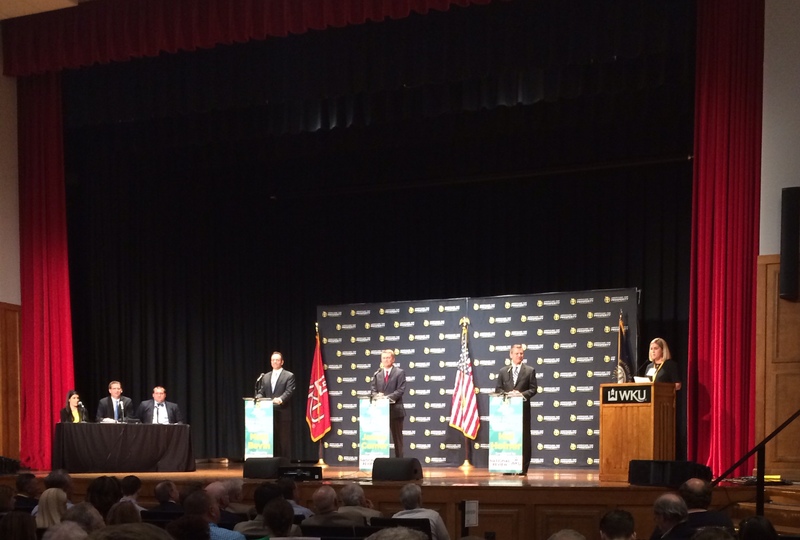 The candidates participating in the debate at Western Kentucky University noted the high number of Medicaid enrollees through kynect and said the state needs to be focused on getting those individuals onto private insurance plans. Comer, Heiner and Bevin also agreed that the state must be a right-to-work state and allow workers to choose whether or not they want to be a member of a union in order to attract more business to the state. The Kentucky Chamber has been a vocal supporter of right-to-work legislation. The issue of job creation was also a part of that discussion as the candidates discussed their ideas for education funding and the need for more trade school graduates in the state to fill high-paying, good-quality jobs that currently go unfilled because of the untrained workforce. Comer discussed his education plan, which includes using incentives and tax credits to allow students to attend trade schools and universities here in Kentucky and ensuring they are employed in the Commonwealth after graduation. Bevin said he would also use state dollars to send students to trade school and Heiner agreed that more has to be done to make sure students come out of school with a degree that makes them employable. Making sure the state has a skilled workforce is one of the main priorities of the Kentucky Chamber and the business community. Candidates were asked about road fund stabilization, an issue passed in the final hours of the 2015 session and a top priority of the Kentucky Chamber. If the legislature had not stabilized the road fund, Kentucky would have lost more than $250 million in the current budget and forfeit the road improvements and thousands of jobs associated with that funding. The political nature of the way Road Fund dollars are allocated was the central problem expressed by the candidates. All three men said they believe the state needs a needs a reformed system when it comes to transportation dollars and agreed that there should be a way to make sure the money is there for projects in the state. The fourth Republican candidate in the race, former Supreme Court Justice Will T. Scott, was unable to attend the debate due to a campaign scheduling conflict as he was at a campaign stop in eastern Kentucky. To see video clips of the debate, you can visit cn|2 Pure Politics.